Determining whether overcoating aged paint systems is a feasible alternative to complete removal and repainting requires careful consideration of several variables, starting with the condition of the existing coating system. Brown cited various methods for evaluating the degree of rusting on painted steel surfaces, such as The Society for Protective Coatings (SSPC) VIS-2 Standard Method of Evaluating Degree of Rusting on Painted Steel Surfaces. Using this standard, corrosion on painted steel surfaces can be compared to photos and other images that illustrate different degrees of spot, general and pinpoint rusting. Other methods for evaluating blistering, testing adhesion and assessing coating compatibility are also available for determining whether aged coatings are candidates for overcoating, Brown noted. According to Brown, cohesive stress exerted on the existing coating system will vary for various generic type coatings. Non-flexible two-component epoxies and aliphatic urethanes will develop more cohesive stress upon curing than more flexible coatings such as acrylic emulsions, long oil alkyds, moisture cured urethanes and epoxy mastics. The use of flexible, low cohesive stress overcoat systems becomes especially important in areas of the country that are subject to frequent freeze/thaw cycles, Brown observed. Some projects may require laboratory analysis in assessing the feasibility of overcoating a painted metal surface. Brown and his technical services staff in Kansas City are regularly called on to analyze old paint material and establish whether a project is a candidate for overcoating. 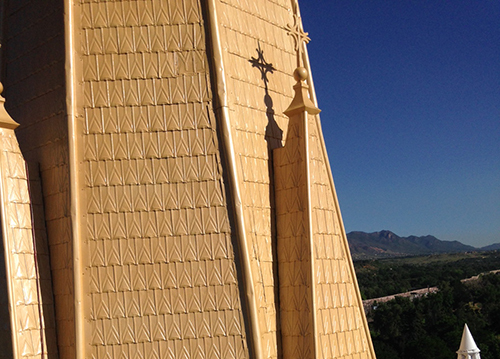 In Colorado Springs, Colorado, coating consultant Andrew Richardson enlisted Tnemec’s Technical Services Department to assess the feasibility of overcoating the spires on St. Mary’s Catholic Church, which is listed on the National Register of Historic Places. The church’s red-brick exterior is accented with cut limestone in a modified Gothic architectural style that includes a pair of bell towers crowned with steep sheet metal spires. 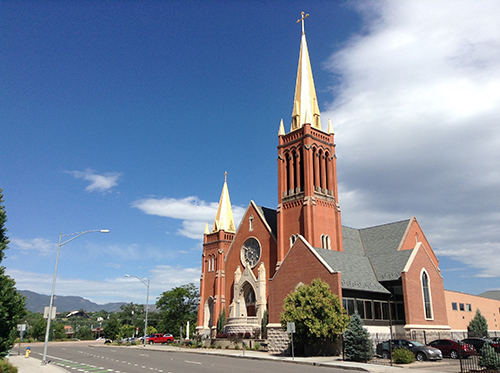 The church was dedicated in 1898, although construction of the bell towers and spires continued for several more years. Working from a boom lift, Richardson examined the condition of the spires and collected samples of the old coating material, which were sent to Tnemec’s technical staff for a generic and overcoat analysis. Laboratory testing determined that the existing paint was acrylic material applied at approximately 6.0 mils dry film thickness (DFT). Series 118 Uni-Bond Mastic, a waterborne acrylic elastomeric coating, was spray-applied as a spot primer and full tie coat. Series 118 is formulated for exceptional adhesion and corrosion resistance over minimally prepared aged coating systems. Another consideration was the location of the church in city’s downtown business district. Richardson cited the “dry-fall” characteristics of Series 118, which reduced the potential for overspray problems on buildings and surrounding property. Series 1078 Fluoronar Metallic, a high-solids fluoropolymer coating, was color matched to achieve a light shade of gold that met the owners expectation. Series 1078 uses high-performance pigments and other ingredients that improve long-term durability, as well as color and gloss retention even in the most severe exposures.